Dell Darling was a strong, tough catcher during the 1880s when few ballplayers used gloves or meager ones at best. One of the many to rise from the fertile amateur fields of Pennsylvania, Darling had a brief stay with the Buffalo Bisons at age 21 before landing a regular job in the majors with Cap Anson’s Chicago White Stockings four years later. A handicap of many catchers, his hitting wasn’t consistent; it relegated him to a backup and utility role through much of his career. He did have some power, though, being one of the few men to hit a ball over the left field wall at West Side Park in Chicago. Darling saw the most action of his career with Charles Comiskey’s Chicago club in the Players League in 1890. Within a year though, he was back in the minors for good. Back home in Erie, his professional career ended amid an alleged involvement in a train robbery scheme. Darling passed away at age 42 due to what some accounts suggest were lingering complications from an old baseball injury. A couple years later his wife married one of his good friends, a former teammate. Conrad Darling was born to German-born parents Conrad and Ottila Darling on December 21, 1861, in Erie, Pennsylvania. Ottila was originally from Bavaria, a separate kingdom during her time there. Darling may be an Americanized version of Dering or Duering or perhaps Düring or the like. The Darlings had four children: George in 1860; Conrad; Catherine in 1865; John in 1868. The senior Conrad passed away at the end of the 1860s. Ottila and her four children eventually settled at 518 East Eighth Street in Erie. The children attended local public schools. Pennsylvania was a hotbed for baseball during the latter part of the nineteenth century. The state sent more than its share into the professional leagues. Conrad grew up near fellow future big leaguers Lou Bierbauer, four years younger, and Mike Morrison, five years younger. Lou had a younger brother, Charles, born in 1870, who also played baseball in the minor leagues. Likewise, Mike’s older brother, John, born in 1865, was a professional pitcher. The Bierbauers also lived on East Eight Street, the Morrisons not far from it. In April 1883 the Syracuse Herald noted, “The Buffalos [of the National League] ave engaged a new catcher, Conrad Darling, an amateur of Erie, PA.” However, he hung around Erie playing ball throughout the spring and early summer. In July, he finally joined the club with fellow Erie resident Ed Cushman, who was about ten years older. Darling was added to the roster to back up Jack Rowe and Orator Jim O’Rourke behind the bat. His major league debut on the 3rd didn’t go well, as the Milwaukee Sentinel described, “The story of the game between the Buffalos and Chicagos today is soon told. An amateur in O’Rourke’s place and a substitute in left field caused a total demoralization of the Buffalos.” Darling, age 21, committed five errors and was charged with six passed balls in a 31-7 rout by Chicago. He appeared in five more games before leaving after the first inning on July 14 due to illness. That was it; Buffalo released him, and Darling returned to the Erie area for the rest of the season. Over the winter Darling weighed his options. It was variously reported that he would join either the Corry or Allegheny clubs. Instead, he signed with Franklin (Pennsylvania) in the Iron and Oil Association in March 1884. He went 3-for-4 with a double, playing second base on Opening Day, May 5. Noted in the Cleveland Herald, “The betting on the game was very heavy between the oil brokers and the Franklin people. It is estimated that $10,000 changed hands.” Later in the summer he joined the local Jarecki Manufacturing team in Erie with friend Lou Bierbauer. Darling kicked off the 1885 season with the Erie Olympics of the Interstate League. Lou Bierbauer and Mike Morrison were also with the club. Darling was used in a utility role, playing in the field at catcher, second base and shortstop and in the outfield. In nineteen games he batted .360. By mid-June Darling held a spot on the Syracuse roster of the New York State League. He batted .258 with the club in 36 games at catcher and first base. He had found his slot in professional baseball, per the Syracuse Herald, “Darling’s work behind the bat here has been par excellence.” He played out the season with the club, barnstorming well into October. A strong Syracuse club won the championship over Utica. Darling appeared in 38 games for Chicago, twenty in right field and twenty at catcher, as the club finished in third place. He batted a steady .319 in 163 at-bats. The Sporting Life declared, “Darling is one of the quietest and most unassuming men in the profession. He plays good ball and for a fact never touches liquor, either in summer or winter.” Teammate Fred Pfeffer further claimed that Darling, blue-eyed and balding, would barely say a word during long train trips and wouldn’t speak unless being spoken to first. Near the end of July he smashed his hand badly behind the plate and couldn’t catch for a couple weeks. 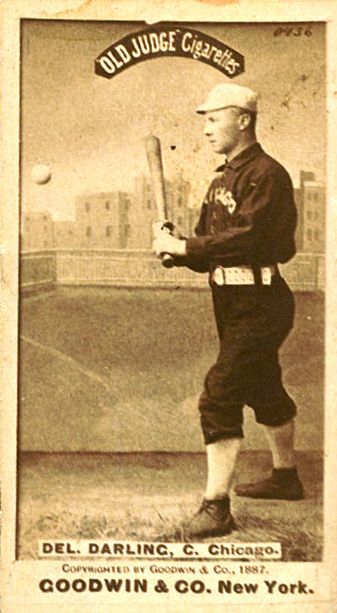 The White Stockings inked him to a contract for 1888 before the current season ended. The 1888 season kicked off in full force on Opening Day on a very cold April 20 versus Indianapolis. In the first inning Paul Hines scored on a hit by George Myers. “While Hines was sliding to the plate, Darling struck him on the back in a vicious way with the ball, but, as the umpire did not see it, no fine was imposed.” The sportswriter found Darling’s actions to be offensive. In actuality, “The trouble between Hines and Darling was made possible by Hines deliberately standing in front of Darling to [block] him in catching a ball thrown from the field. Darling made two attempts to push Hines away, and failing in that, struck him a smart blow on the back.” Hines admitted to as much later. The tension between the two clubs escalated later in the game as Dude Esterbrook and Marty Sullivan traded punches. Although with the club the entire season, Darling only appeared in twenty games, all at catcher. Despite barely using the backstop, Cap Anson liked his production in the field and at the bat when he was in the lineup and signed him for the upcoming season at a rate of $2,500. However, just after the season started in 1889, Chicago sold Darling with Frank Dwyer to Minneapolis, though the deal fell through. Darling appeared in thirty-six games at catcher for the White Stockings. Along with many of his union colleagues he jumped to the Players League by November, at the same salary. Chicago Pirates manager Charles Comiskey used Darling in a utility role in 1890. He played in nine games at catcher, 49 games in the infield, and seven in the outfield, and was among the league leaders in batting average in late August until falling to .258 by the end of the season. With the collapse of the Players League, Darling was expected to rejoin Anson and the Chicago Colts for the 1891 season. However, Chicago released him before spring training on February 26. Minneapolis, of the Western Association, still wanted his services, and he signed with the club soon after the release. On June 11, Darling sent three balls over the left field fence in a 12-7 victory over Milwaukee. A fourth blast hit the netting and fell back into play for a double. By August, the Minneapolis club was failing financially. Al Spalding sent an agent to Minneapolis to bring Darling back. Instead, the catcher contacted his old skipper Comiskey, who now managed the St. Louis Browns in the major American Association. Darling, Mart McQuaid, and George Rettger jumped Minneapolis and joined the Browns on August 12. The defections proved fatal for the Minneapolis franchise, and it disbanded on the 20th. Darling had appeared in 84 games for Minneapolis, hitting .299. Despite his early departure, he still led the league in home runs with eighteen. With St. Louis, he appeared in 17 games. The September 10 contest versus Boston, an 11-3 loss, proved to be Darling’s final major league appearance. In a total of 175 games in the big leagues, 108 at catcher, he batted .240 with 83 RBI. On January 7, 1892, Darling married fellow Erie native Anna M. Crum, ten years his junior. The couple had seven children: John, 1894; Lawrence, 1896; Walter, 1897; Matilda, 1900; Catherine, 1902; George, 1904. Another child was born and died during the 1890s. Darling and family took over his mother’s home on East Eighth Street in Erie. On March 24, 1892, Darling signed a contract with the Western League. President James A. Williams assigned him to Kansas City’s roster. In April, though, he was awarded to Toledo by “the Players’ Committee of the Western League.” Darling remained with the club until the league disbanded on July 15. In 33 games he hit a poor .161 as a utility player. In December he made headlines of another kind. Conrad Darling fell ill in early 1904 and died on November 20 at age 42. Some reports claim that his deterioration was due to an old baseball injury. He was interred at Trinity Cemetery in Erie. Anna married Darling’s old team and running mate Charles Bierbauer in 1907. His wife had recently passed as well. They continued to live at the Darling residence, melding three children from his first marriage and two more from the new union. The Darlings’ sons John and Walter drowned in an accident at Presque Isle’s Misery Bay two years after Conrad’s death. Appreciation is extended to Ray Nemec for providing Darling’s minor league statistics. Thanks to Frank Russo for exchanging emails with me concerning Darling’s death. Unfortunately, the reference about an old baseball injury has yet to be confirmed or denied. Johnson, Lloyd and Miles Wolff. The Encyclopedia of Minor League Baseball. 2nd ed. Durham, NC: Baseball America, Inc., 1997.